A bit of Jo for YOU! 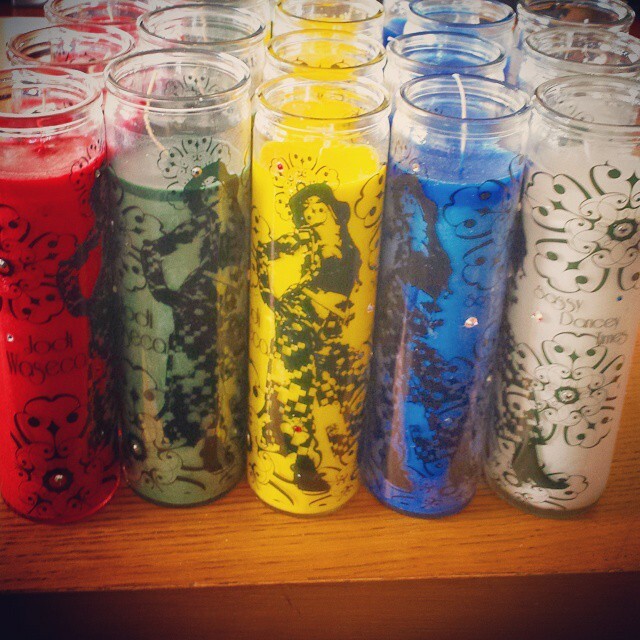 "7 Day" various colored candles with my sassy face on em! They come emblazoned with rhinestones or not, your choice. or I will deliver to you if I am in your area! Shoot me an email HERE to work out ordering and delivery! OR! Visit my Etsy page and order! $1.50 for both, or free with purchase of t-shirts or candles! Check out my Etsy page to order! World Dance New York's Fire Pre-Performance & Safety instructional video with Jodi Waseca demonstrates the basics of preparing for a fire performance act such as fire eating, fire dancing, and other genres of movement requiring the manipulation of fire. The video offers crucial guidelines for keeping yourself and your audience safe during your show. As a beginner fire performer, you need to know the types of fuel to use and the fire tools that go with each type of fuel. The choice of fuel depends on whether your performance is indoors or outdoors, as well as other factors. Jodi walks you step-by-step through the process of creating a basic static fire tool -- a torch -- from scratch. She details the types of wicking and metal components that are safe to use, and shows the technique of tool assembly. The torch is the basis for making other fire tools, such as fire fingers or fire poi. Jodi demonstrates the process of setting up a fueling station, handling the fuel, lighting up, and ways of detecting how long the tool will burn based on the color and texture of the fire. A special section of the video teaches working with a fire safety assistant, explaining his/her responsibilities, fire extinguishing tools and technique, and methods of communication between the performer and the assistant. Safety instruction covers the types of environment and weather conditions safe for performance, as well as inspection and maintenance of fire tools. The video also includes Jodi Waseca’s fire dancing performance, demonstrating her technique of working onstage with fire fingers. I also make sushi...trained for 9 years-no kidding! Want some? Email me!